American Express is best known as a charge card and credit card issuer, but the company also offers other products and services, including travel booking and planning using Amex Travel. While American Express Travel is available for anyone (not just cardmembers), holding an Amex card can definitely help you get extra value when using the program. In this guide, we’ll take a look at what Amex Travel is, what services it provides, what it costs to use, and the best ways to use it…when it’s worth using! Why Should You Use Amex Travel? What Is The Hotel Collection? What Is Fine Hotels and Resorts? At its most basic, American Express Travel is an online travel booking portal (or “online travel agency”) just like Expedia, Kayak, and Orbitz. You can use it to book a whole trip or just parts including flights, hotels (or flights + hotel packages), rental cars, or even cruises. It’s also possible to book by phone. Flights booked through the portal can be subject to small fees. However, sometimes the benefits can make these fees worth it, and they’re waived for holders of The Platinum Card® from American Express. There are also a few “sub-categories” that fall under the Amex Travel umbrella, including The Hotel Collection and Fine Hotels and Resorts. The main reason to book with American Express Travel is to benefit from its incredible customer service. If you run into any problems during your trip (like delays, cancellations, overbookings, etc. ), you can connect with a live travel agent by phone 24/7 who will work with you to find a solution. Additionally, if you hold an American Express card that earns Membership Rewards points, you can often earn 2x points or more by using it to pay for travel services booked through Amex. Hot Tip: If you use The Platinum Card® from American Express, you can earn 5X Membership Rewards points on flights booked directly with airlines or with American Express Travel. This includes eligible hotels as well when booked with Amex Travel. Anytime you book a flight through the Amex portal (either on its own or as part of a package), you’ll pay a fee of $6.99 for domestic flights and $10.99 for international. The fees are waived if you have The Platinum Card® from American Express and are logged in. If you choose to book a flight by phone rather than online, there’s an added $39 phone service fee. If you make changes to your flight, there’s a $39 reissue fee in addition to whatever fees the airline charges. This only applies to advance changes, not changes due to problems like canceled flights. Below, we’ll take a look at how to use Amex Travel to book flights, hotels, vacation packages, rental cars, and cruises. Searching for flights with Amex Travel is similar to just about any other online travel agency. You can search by city or by specific airport, select your departure and return dates, and click whether you want to search for lower fares within 3 days of your chosen dates. On the results page, American Express lists the most relevant Delta result at the top highlighted as a “featured airline.” This is because Amex and Delta have a partnership. The featured airline is followed by the lowest available fares. When you scroll down, you can use the controls on the left sidebar to filter results by number of stops, departure/arrival times, airline, or even specific flight number. By default, flights are displayed in price order starting with lowest, except for a featured Delta flight at the top (when available). At the top of the search window above the results, all available airlines are shown, as well as the lowest available price with each airline. Use the filters on the left side to narrow down the results. Depending on your search, you may see a blue tab labeled “Insider Fares Available” above some of the airlines listed at the top of the search window. These are discounted fares, and they only apply if you pay for the entire flight with Membership Rewards rather than cash (note that cash prices are rounded to the nearest dollar). If you’re logged in and have enough Membership Rewards points to cover the entire flight, you will be able to see discounted fares. For example, in the below search, I found an Insider Fare that I had enough Membership Rewards points to purchase. The Insider Fare offered me a slight discount rather than just matching the cash price in points with each point worth 1 cent (more on that below). When using Amex Travel, Insider Fares are basically flights you can use Membership Rewards to book. Your points will be valued slightly higher than the normal 1 cent each. The difference can be fairly minimal. In my JFK-ATL example above, the discount was from 25,259 MR points to 24,120 — changing my value from 1 cent per point to about 1.05 cents per point. American Express Travel charges a fee to book, but they bundle this into the displayed price. The fee is $6.99 per domestic ticket or $10.99 per international ticket. These fees are waived for holders of The Platinum Card® from American Express or the Centurion® Card from American Express who are logged in to their online Amex account. For some reason, when I went to book sample flights to London through Finnair, I found the same price listed whether I was logged in or not. Every other airline showed the fee correctly, so I assume this was a glitch with Finnair bookings. I searched for several different flights across different online travel agents, and I found similar results to the below example each time. To compare prices, I searched multiple online travel agents and portals using the same search parameters: departing JFK, arriving LHR, round-trip, 1 traveler, economy, and nonstop on specific dates. I selected the lowest-priced nonstop flight available through American Express Travel: a Finnair flight operated by Oneworld partner American Airlines. For some reason, booking this flight through Finnair was cheaper than booking through American. When I searched on Amex Travel, the flight was $595.86. (On the search screen, Amex rounds the price to the nearest dollar so it was listed as $596). This was broken down into a $133 base fare and $462.86 of government, airline, and American Express-imposed fees. I tried to search for the same flight on Finnair’s U.S. website, and found the same price breakdown. This was true on Kayak and Orbitz. Another comparison on Delta from Phoenix to Los Angeles. I also tried a second search for a domestic round-trip from PHX-LAX on the same dates. This flight was $199.40. When I searched for the same itinerary on Delta’s website, I found the same price listed for a regular economy fare, minus the Amex Travel fee waiver: $199.40 (basic economy, which was not available through Amex Travel, was a little bit cheaper). Other online travel portals, including Orbitz and Kayak, listed the same price. This means that if you’re already set on the specific itinerary you want to fly, booking through Amex Travel should cost the same as booking directly or through a third party (plus the fee, unless you have the Platinum Card® from American Express). However, what if you’re just looking for the cheapest flight on particular dates? If you do a general search for a route on set dates, will American Express Travel find the same lowest rates as other portals? The answer here is no. 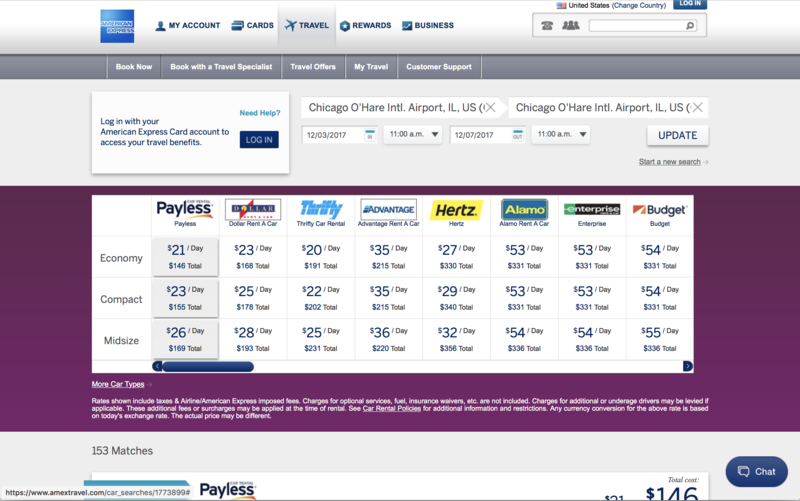 In my search, the cheapest flights on other portals and websites were lower than what Amex Travel offered. *Should be $571 including the fee, which was not appearing due to a glitch in certain Finnair bookings. Other searches, including for domestic flights, showed similar results. The Amex portal doesn’t include some ultra-low-cost carriers like Norwegian, so travel portals that do will often win on price. Even excluding the low-cost carriers, though, other portals like Expedia and Orbitz were able to offer lower fares by about $15. That said, American Express Travel was able to find about the same fares you would find when booking directly with an airline. Let’s look at the 2 more exclusive programs first. American Express guarantees that any hotel booked through Amex Travel will have the lowest publicly-available rates (prepaid rates only). To test this, I did sample searches for several hotels and dates, including for the Hyatt Centric in New York City’s Times Square. The Hotel Collection properties were indeed cheaper by a few dollars per night than when booking directly or through other travel portals (for the same room at the same prepaid rate). Rooms have to be booked through Amex Travel. That means that if you book directly through the hotel or another service, you won’t get the perks, even if the hotel is a part of The Hotel Collection and you pay for the stay with your American Express card. Further, there is a minimum stay of 2 nights, and you can’t book consecutive stays within 24 hours of each other. The good news is that the benefit is available for up to 3 rooms per stay. So if you book 3 rooms for family members, you’ll get a total hotel service credit of $225. Typically, you won’t earn points through a hotel loyalty program if you book through a third party, and that includes American Express Travel. Further, you won’t get any elite benefits that you might otherwise be entitled to if you have status with that hotel chain. Bottom Line: The Hotel Collection is potentially useful if you’re planning to pay with your eligible Membership Rewards-earning card. You will get 1 extra point for each dollar spent, and the $75 credit and room upgrade can be useful. However, this will come at the expense of hotel-specific elite benefits, including points and elite credits in any hotel loyalty program. Also, keep in mind that the benefits only apply to prepaid bookings — make sure to check rate terms to see the cancellation policy. American Express Travel runs a second hotel program called Fine Hotels and Resorts (FHR). It can be a little bit confusing since it sounds like it would overlap with the Hotel Collection, but that’s not the case. The Fine Hotels and Resorts program is exclusive to The Platinum Card® from American Express holders (personal or business), as well as those with the invitation-only Centurion® Card from American Express. FHR includes different hotels and resorts than The Hotel Collection with minimal overlap. (I did a handful of searches and couldn’t find any, but it’s possible there are overlapping hotels that just weren’t available). The FHR collection tends to be more geared toward leisure travelers who can book stays at higher-end properties. Unlike The Hotel Collection, rooms booked through Fine Hotels and Resorts are not all prepaid. In fact, most are standard rates that you’ll pay for at the end of your stay. In comparing several properties, including the Park Hyatt in Chicago, I found rates identical to the non-prepaid rates when booked directly through the hotel. However, keep in mind that prepaid and early-purchase options may be available directly from the hotel — and are likely much less expensive. Of course, you won’t benefit from the Fine Hotels and Resorts perks. There are fewer terms with Fine Hotels and Resorts than with The Hotel Collection. You must book through American Express Travel/FHR to receive the benefits. As with The Hotel Collection, if you book directly with the hotel or through a different travel agency or portal, you won’t be able to claim FHR benefits even if it’s a participating hotel. Other terms vary by property. Good news here! Unlike stays booked through The Hotel Collection, stays through American Express Fine Hotels and Resorts count as “qualifying rates” for hotel loyalty programs. That means if you’re staying at a hotel that’s part of a loyalty program, you’ll be able to earn points and receive the relevant benefits if you hold elite status. Bottom Line: It’s possible to get some valuable perks from the Fine Hotels and Resorts program, although you’ll still be paying luxury prices. If your main priority is budget, you won’t find much use from FHR. By default, search results are ranked by “recommended,” which seems to be decided by an algorithm factoring in price, location, and reviews. Terms vary by the specific hotel and rate you book, so make sure to read the fine print. This site can be a little confusing to compare prices since American Express doesn’t include all taxes and fees in the first price displayed (while some hotel websites do). For example, I searched for a 4-night stay at the Hyatt Regency London – The Churchill. American Express listed it at an average of $337/night, which should mean a total around $1,348. When you go to book, though, the total is shown including fees: $1,625. While it initially looks more expensive to book directly with Hyatt (where the cost is listed at $404/night), that price includes all taxes and fees, so the listed total is actually less: $1,611. My search for Marriott Regent Park yielded similar results. It’s listed at $233/night in the search function, which implies the total is $932. In reality, once you click through, the total is $1,120. Booking directly with Marriott, rates are listed at $261/night, but that includes taxes and fees — for a total prepaid rate is $1,080. In both tickets, American Express Travel was within a few dollars of the other online travel agencies, which were all more expensive than booking directly through the hotel’s website. Like with The Hotel Collection, rates booked through American Express Travel aren’t eligible for elite benefits or hotel loyalty points. Bottom Line: Like most other online travel portals and agencies, prices can vary between Amex Travel and the hotel’s direct booking channel. You won’t get elite benefits or hotel points, so it might be worth booking directly if those are valuable to you. Otherwise, compare prices and consider what spending bonus you could get for using your American Express card, as well as what you could gain from customer service. Like with many online travel portals and even airline websites, you can book packages that include flights and hotels through Amex Travel. Usually, the point of booking these packages is to get a discount, special perks, or promotions. The search window for Flights+Hotels is simple: it just asks for airports (or cities), dates, number of travelers, and rooms. Results are listed in a recommended order by default just like when searching for a standard hotel. Terms vary by the specific package you book, so make sure to read the fine print! As with standalone flight reservations, Amex Travel charges a fee to book Flights+Hotel packages: $6.99 per domestic ticket or $10.99 per international ticket. These fees are waived for holders of The Platinum Card® from American Express or the Centurion® Card from American Express who are logged in to their online Amex account. In the results field, a total starting price per person is listed, including all taxes and fees with the cheapest flight option. American Express also lists how much you’re saving with the package, although this is missing for some hotels. Rates are listed per person, including flights and hotel room. Once you select the hotel, you can customize your flight. The total price changes based on which flight you pick. 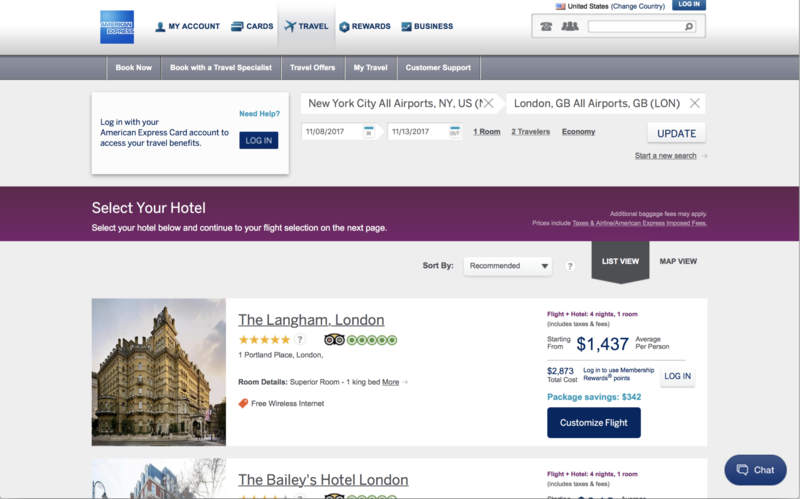 In one sample search, I chose the Hyatt Regency Churchill London (like in the previous section) and picked the cheapest nonstop flight: British Airways EWR-LHR and LGW-JFK. The package came to $1,446 per person, or $2,892 total. Annoyingly, American Express Travel doesn’t show a breakdown of hotel and airfare costs and fees; instead, it just displays a total per person. To compare, you can search the flight and hotels separately. I tried searching the flight first on the same days. I found Finnair flights operated by American Airlines for $660 per person — an option that wasn’t offered as part of the package (although with the booking fee, the flights should have been $671). 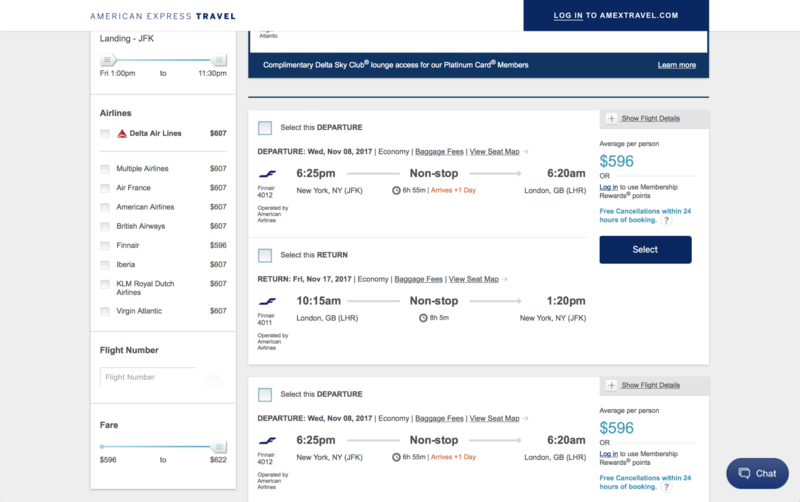 When I filtered the search to British Airways only, I got a ton of options for $671. I searched hotels next, again choosing the Hyatt Regency Churchill’s lowest prepaid rate. It was listed as $337 per night for 1 room (plus taxes and fees), for a total of $2,031. For the 2 flights and the hotel, that comes to a total of $3,351, or $1,675.50 per person. In this case, booking the trip as a package saves almost $460, even though the search results page didn’t highlight any savings specifically. The main downside to booking a package is that you have less flexibility. Say you want to change hotels for part of the trip or maybe stay with friends for the last few days. This isn’t an option because you must book the single hotel for the entire time between your flights. It can also make solutions harder to find if there are any problems — although the American Express Travel customer support should make up for that. Bottom Line: If you’re using American Express Travel and your plans allow for the lack of flexibility, you might be able to save a lot of money with a package. Just make sure to compare the listed price to booking everything separately. Note that you can’t book a package retroactively: you have to book the flights and hotel at the same time, rather than booking one first and coming back later to book the other. If you do that, you’ll have to stick with booking separately (with no savings)! American Express Travel also offers a rental car booking service. You can make reservations from rental stations at airports and elsewhere. To search for rental cars, simply enter an airport or city. You can also click a button to search near a specific address. Results are shown in a handy grid format, with each column showing a different rental company, and each row displaying the pricing for a different category of car (economy, compact, midsize, and so on). Results are shown in a useful grid format, making it easy to compare providers. Bookings of up to 4 days are charged a daily rate, while bookings 5-7 days are charged on a weekly basis. There are specific rates for weekends and weekdays, as well as monthly options, with specific details varying by rental agency. In several sample searches, prices were generally consistent with other online travel agencies — though sometimes lower by $1-$2/day. Prices were identical to booking with the rental company directly. Bottom Line: Renting a car through Amex Travel doesn’t get you any benefits above what you’d see by paying with your credit card (such as the collision damage waiver when paying with The Platinum Card® from American Express). However, the convenient search page makes it a good way to compare multiple prices at once. As a bonus, even if you book through Amex Travel, you are still eligible for points and benefits from the specific rental loyalty programs. Just make sure to check all the terms and conditions when booking a rental. Amex Travel also offers tools to book cruises. In addition to letting you search for cruises all over the world, Amex Travel periodically highlights special offers on cruises, usually in the form of credits to use on board. To search for cruises, you need to enter the region you want to travel in, the cruise line(s) you want to travel with (or search all available lines), the month you’re planning the trip for, and the approximate length of the cruise you want. Results are showing in price order, with the lowest first. Note that this is based on the lowest available rate; hovering over any result will show all available cabin types and the corresponding prices. Under each result, information shown includes port of departure/return, date of departure, and ports visited. Cruise rates booked through American Express Travel were within $1-2 of rates found on other online travel agents and websites. I also found identical prices on the various cruise company websites — though each online travel portal and cruise line offers different promotions, so it might be worth comparing them. 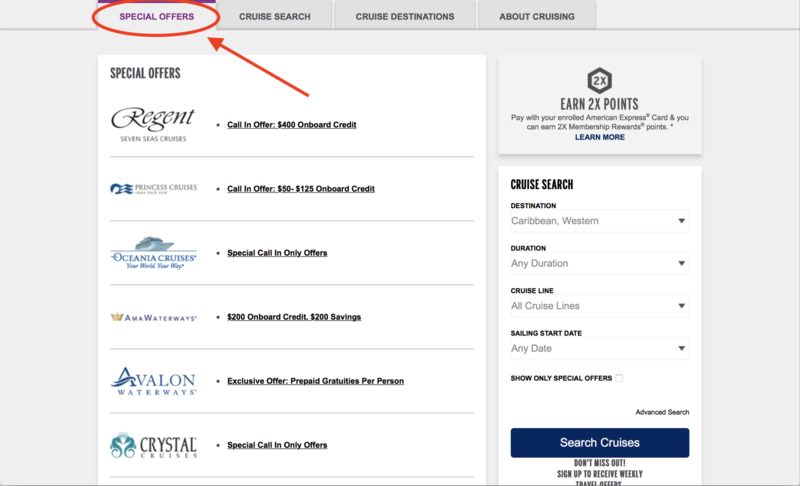 For example, during a sample search for a weeklong Caribbean cruise in December, I found that Royal Caribbean was offering a $50 onboard credit if you booked directly. On the search results page, you might notice a tab labeled “Special Offers.” Those offers are generally onboard credits, but can also include discounts or other special features. If you aren’t committed to a specific cruise line, these are often worth exploring. Make sure to click the “Special Offers” tab when you’re viewing search results. Cardmembers who have The Platinum Card® from American Express have special access to the Cruise Privileges Program. Like the Fine Hotels and Resorts program, this is only available on specific cruises, although it’s more limited than FHR. It includes an onboard credit (often higher than otherwise offered) and a special onboard amenity, like complimentary dinner for 2 or a bottle of premium champagne. Bottom Line: It can be worth booking a cruise through American Express Travel, especially if there are special offers. Make sure to compare different booking sites, though, as some may have better or exclusive promotions. Amex Travel offers a feature called Travel Insiders. When you use the program, American Express connects you with a travel expert who can help you plan an itinerary based on your destination. Fees vary based on location, length of the trip, and details of the itinerary. Amex Travel can be a useful tool for booking flights, hotels, vacation packages, cruises, or rental cars. In many cases it doesn’t offer the best rate options for flights or hotels, but it’s worth comparing to other booking sites and airlines/hotels directly. If you have certain American Express cards, the perks available through The Hotel Collection or Fine Hotels and Resorts can be worthwhile. Additionally, the extra Membership Rewards points you earn by booking through Amex Travel (especially with a rewarding Amex card) can be valuable, as long as you aren’t paying too big of a premium through Amex Travel. Aside from The Hotel Collection and Fine Hotels and Resorts, the real value of American Express Travel is in the customer service provided. Booking a trip on your own is easy — dealing with problems when they arise can be less so! If you book through Amex Travel, you’ll have easy access to someone who can help you get on a new flight, find a new hotel, or manage whatever other issues come up day or night. So if you’re willing to pay a (usually small) premium to have that extra support, then Amex Travel might be a good choice for you! American Express Travel is an Online Travel Agency (OTA), just like Orbitz, Kayak, or Expedia. You can book flights, hotels, rental cars, or cruises through Amex Travel. Do I need an American Express card to use Amex Travel services? Whether or not you have an American Express card, you can book flights, hotels, rental cars, or cruises through Amex Travel. If you do have an Amex card, you might be eligible for certain perks or rewards. Does American Express Travel cost anything? If you book a flight through American Express Travel, there’s a small fee ($6.99 for domestic flights, $10.99 for international) that is waived for certain cardmembers. Other services, like hotels and cruises, do not have fees. Why should I book with American Express Travel? American Express Travel has notoriously helpful customer service resources. That means if you have any problems with your trip (like a cancelled flight), you can call an agent who can help solve the issue.